Community and charitable organizations rely on assistance through community volunteering and support. Caring individuals and committed companies help the organizations to make a positive impact in the community. With gifts of time, talent, and treasure, we extend the ability of these organizations to do good. Those who volunteer also benefit in many ways. We connect to our community and enjoy a sense of purpose and accomplishment. It can feel very satisfying to be of service to others. Also, volunteering our time and talents helps to strengthen our communities. It can improve the lives of others and may even transform our own lives. We can’t underestimate the importance of community volunteering and support. Financial and volunteer support is often critical to ensuring the success of fundraising events. Here at Pet Factory, we’re fortunate to be part of a wonderful, caring community. A wide variety of valued community organizations help to make our headquarters in Mundelein, IL a wonderful place to call home. Feed My Starving Children – Hope starts with food. FMSC organizes volunteer packing events and distributes nutritious food to children worldwide. Pet Factory hosted the Feed My Starving Children 2017 Hunger To Hope Mobile Pack Event. Village of Mundelein – The Village hosts an annual festival in the summer. It includes a pet parade, carnival, food vendors, fireworks, and more. Sav-A-Pet – Sav-A-Pet is one of the largest no-kill dog and cat rescues in Lake County.They operate a full-time adoption center. Mother’s Trust Foundation – The Foundation provides immediate assistance to children in crisis. Their focus is on helping low-income kids living in Lake County, IL. Pet Factory supports Mothers Trust Foundation at the 8th Annual Golf Outing. 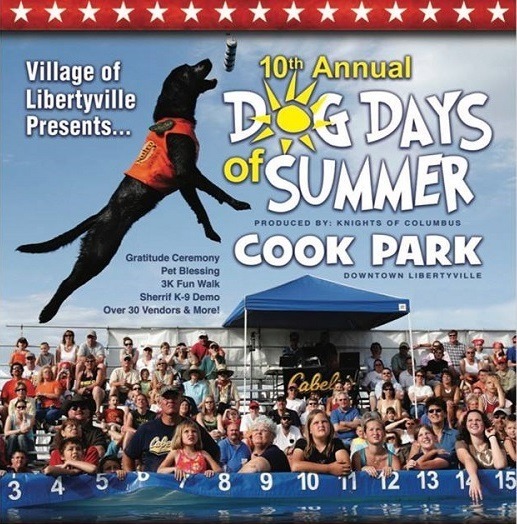 Village of Libertyville – The Village hosts a dog-focused event each summer. The public 3-day event includes a variety of fun activities. These include a canine aquatic jumping competition, 3K fun walk, Sherriff K-9 demos, vendors, and more. Arthritis Foundation – The Arthritis Foundation hosts an annual 5K fundraiser in our county. Participants raise money and walk to end America’s #1 cause of disability. 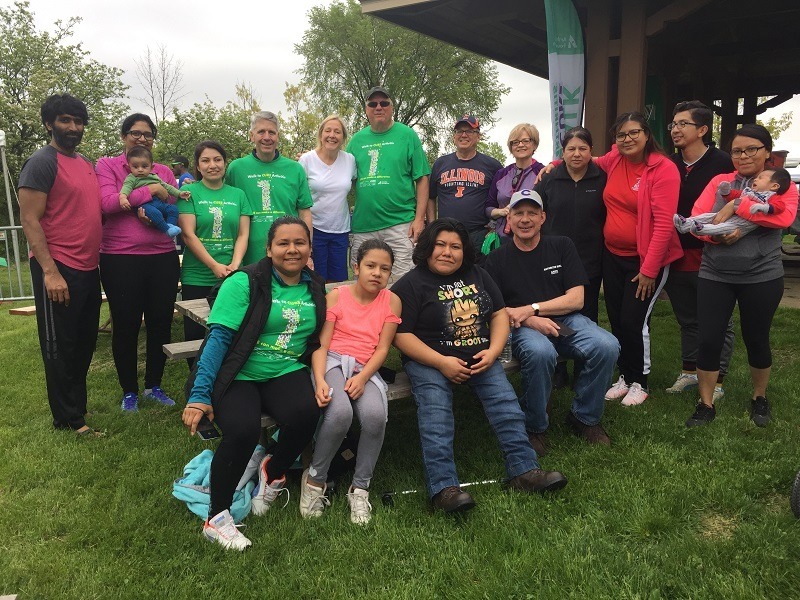 The walk is in May at the Lake County Forest Preserves. Rotary International – Members of our local Rotary club are involved in many charitable works. In addition, they host fundraisers and use the funds raised to help local charities. In the past year, the Libertyville Sunrise Rotary Club awarded over $120,000 to local charities. Pet Factory sponsors Libertyville Sunrise Rotary’s Winter Fundraiser. Here at Pet Factory, we are committed to community volunteering and supporting local charities that make a difference. The needs are great – right here in our own area and around the world. Because of this, we are proud to volunteer and provide financial support for a number of worthy local organizations. We hosted the Feed My Starving Children 2017 Hunger To Hope Mobile Pack Event in December, 2017. 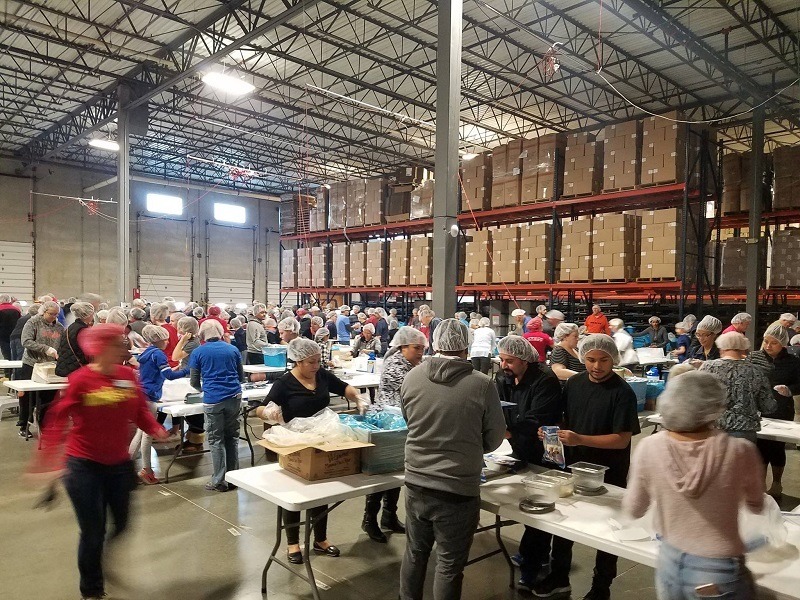 The 2-day pack event took place in our factory and over 2,200 community volunteers packed 544,320 meals. The food was transported to South Sudan on 12-2-2017 and Uganda on 2/1/2018. In addition, over $135,000 was raised to pay for all the meals. Pet Factory contributed $2500. We will be hosting the 2018 Hunger to Hope event again this year on November 30 – December 2, 2018. Join us! Since 2012, we have sponsored the Village of Mundelein’s Mundelein Community Days Pet Parade at the Silver Level. Since 2013, Pet Factory has sponsored Sav-A-Pet, a local no-kill dog and cat rescue organization. In 2013-15 we donated $4,500 as a sponsor for Save-A-Pet Pet Days. In addition, we teamed up with Mickey Finn’s Brewery to run an awareness campaign and fundraiser for Sav-A-Pet. In December, 2015, the brewery and Pet Factory donated $6,000 to Save-A-Pet through sales of Pet Factory Witt beer. Over the past four years, Pet Factory has contributed over $17,000 to Sav-A-Pet. 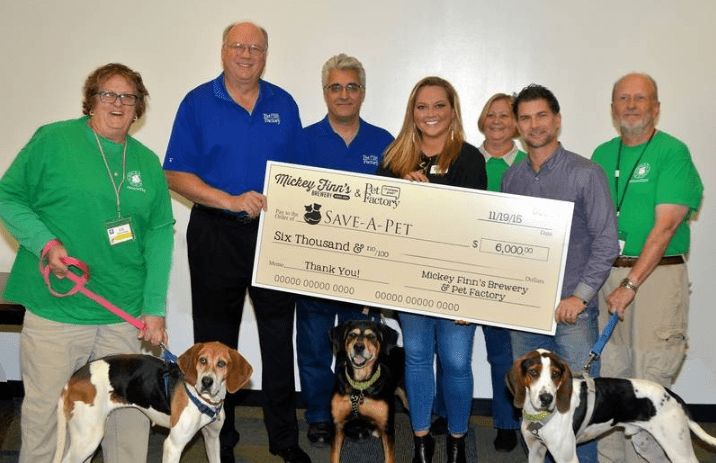 Pet Factory teams up with Mickey Finn’s Brewery to run an awareness campaign and fundraiser for Sav-A-Pet. 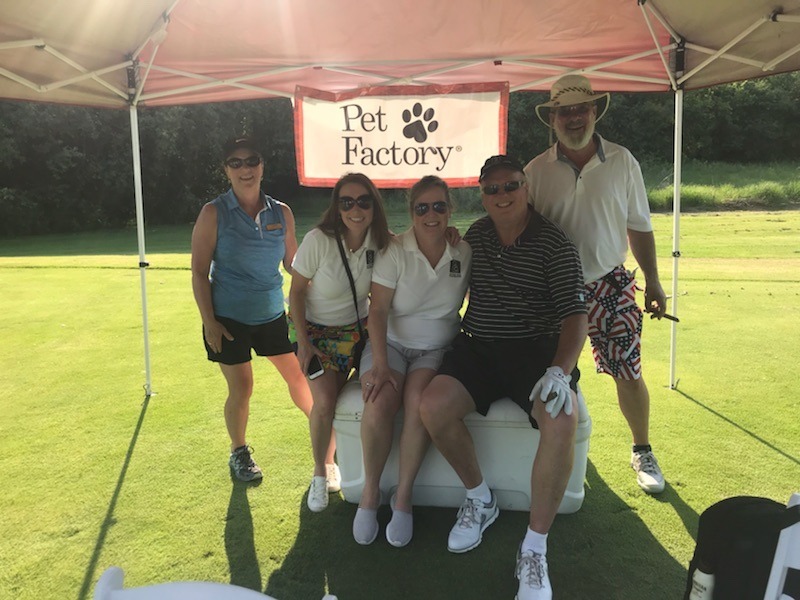 For the past two years, Pet Factory has sponsored the Mother’s Trust Foundation Golf Outing fundraiser for low-income children. This year, we are sponsoring the Village of Libertyville Dog Days of Summer. It takes place in downtown Libertyville in early July. We have participated in the 5K Lake County Walk to Cure Arthritis as members of Team Sisu for the last 18 years. 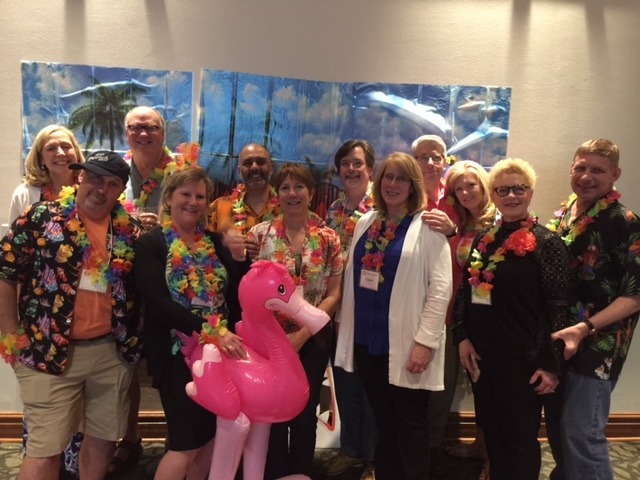 Since it began fundraising efforts on behalf of the Arthritis Foundation, Team Sisu has raised over $180,000. For many years, Pet Factory has helped with Libertyville Sunrise Rotary Foundation activities and events. The events benefit local charities. We raise funds at the Winter Fundraiser in which Pet Factory is a major sponsor ($2,500). We are also a major sponsor ($2,500) of the club’s 2018 North Shore Wine Beer and Cigar Fest. It will be in downtown Libertyville on August 25, 2018. Community and charitable organizations rely on the help of volunteers and supporters. Caring individuals and committed companies help the organizations to make a positive impact, both here and abroad. Those of us who live and work in the Mundelein area are fortunate to be part of such a wonderful, caring community. Here at Pet Factory, we’re proud to call Lake County home.